INDUSTRIAL VINTAGE SHELF BRACKETS - MADE FROM PIPE FITTINGS! VARIOUS STYLES! INDUSTRIAL VINTAGE STYLE, FUNKY WALL MOUNTED BOOK SHELF / SHELVES / BOOKCASE!! 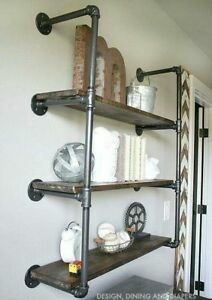 VINTAGE STYLE SHELF / SHELVES / BOOKCASE - MADE USING INDUSTRIAL PIPE FITTINGS! pipedreamfurniture has no other items for sale. Details about VINTAGE STYLE SHELF / SHELVES / BOOKCASE - MADE USING INDUSTRIAL PIPE FITTINGS!